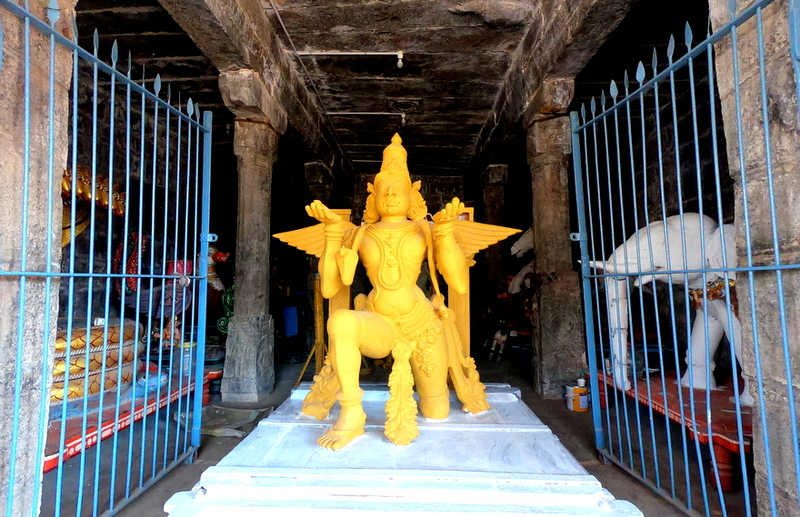 Nithyakalayana Perumal temple in Thiruvidandai, a village in Chennai, Kanchipuram district of the South Indian state of Tamil Nadu. 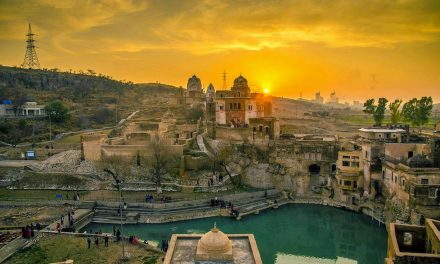 This temple is widely believed to bestow good luck to those wishing to get married, and help remove obstacles that prevent marriages. 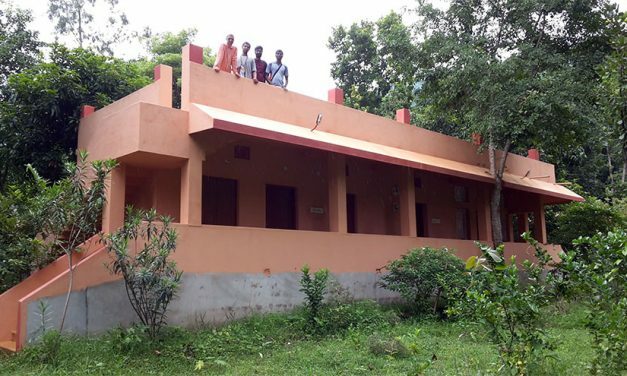 Many unmarried men and women visit this temple to worship the Lord and get married soon. 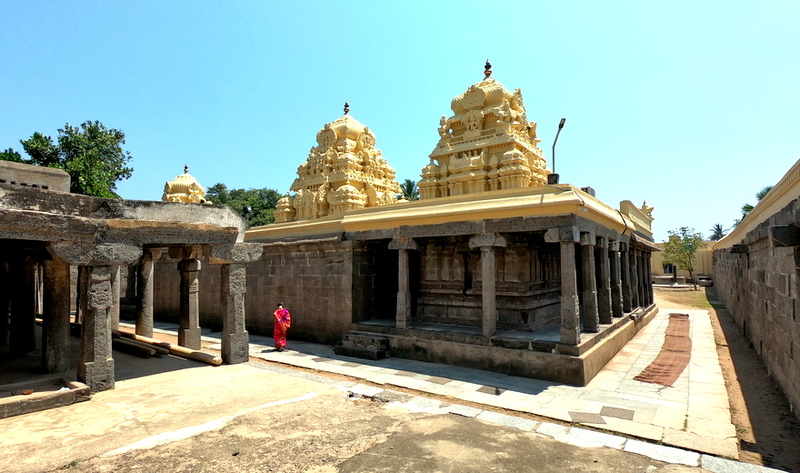 This place is also called as Thiruvidandhai, got its name as the Lord here is seen holding Sri Lakshmi on His left lap. 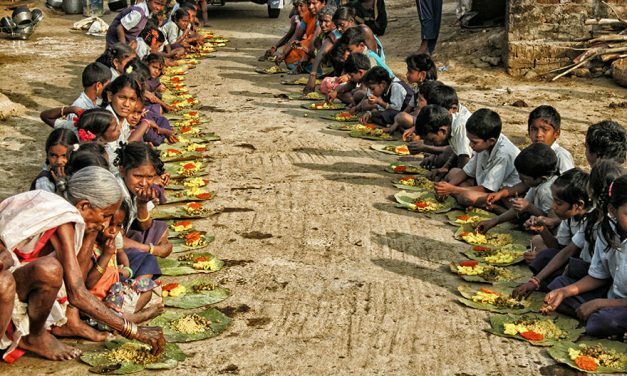 In tamil ‘Thiru’ means Lakshmi, ‘Ida’ means left and ‘Endhai’ means ‘my father’ (God). Hence the place came to be known as Thiru Ida Endhai which later corrupted to become Thiruvidandhai. 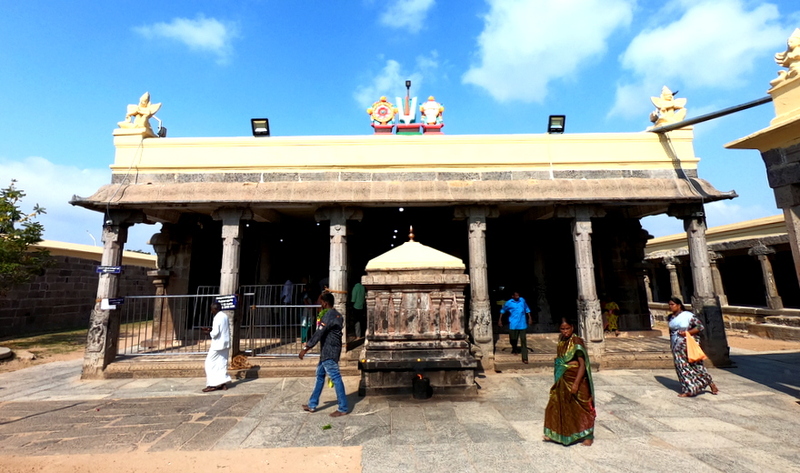 Constructed in the Dravidian style of architecture, Nithyakalayana Perumal temple is revered in Nalayira Divya Prabhandam, the 7th–9th century Vaishnava canon, by Thirumangai Azhwar. 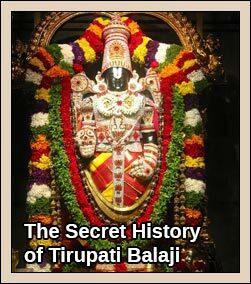 The temple is classified as a 62nd Divyadesam of 108 Vishnu temples that are mentioned in the book. 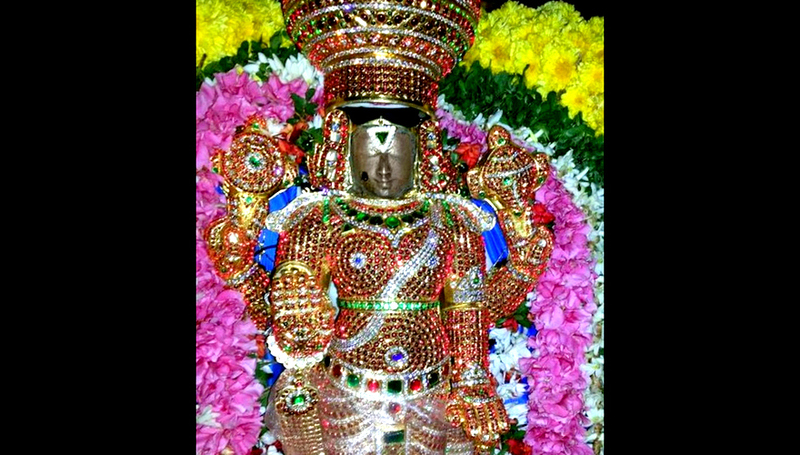 Thirumangai Azhwar has glorified the powers of Komalavalli Thayar. 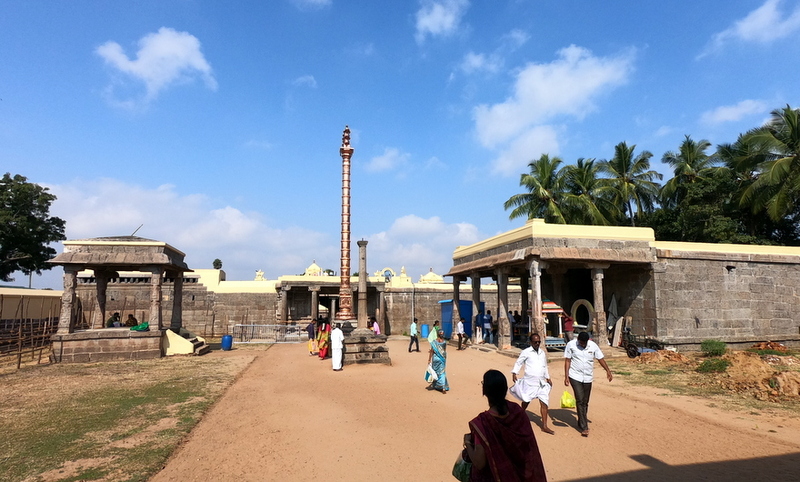 The temple also finds mention in later works by Nathamuni, Thirukachi Nambi, Ramanuja and Manavala Mamunigal. As per Hindu legend, Vishnu’s gatekeepers Jaya and Vijaya are cursed by sages that they would be born as asuras (demons) during their next birth. They were born on earth as Hiranyaksha and Hiranyakashipu to sage Kashyapa and his wife Diti. The demon brothers on account of their powers, take control of the universe. 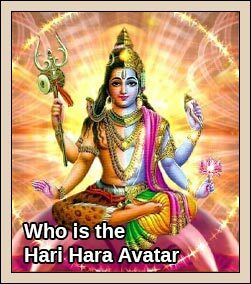 The elder brother Hiranyaksha practices penance and obtains a boon from Brahma which makes him invincible by any animal or human. Hiranyaksha captures earth, personified as goddess Bhudevi and hides her under the ocean All the celestial deities and sages went to Vishnu for rescue. 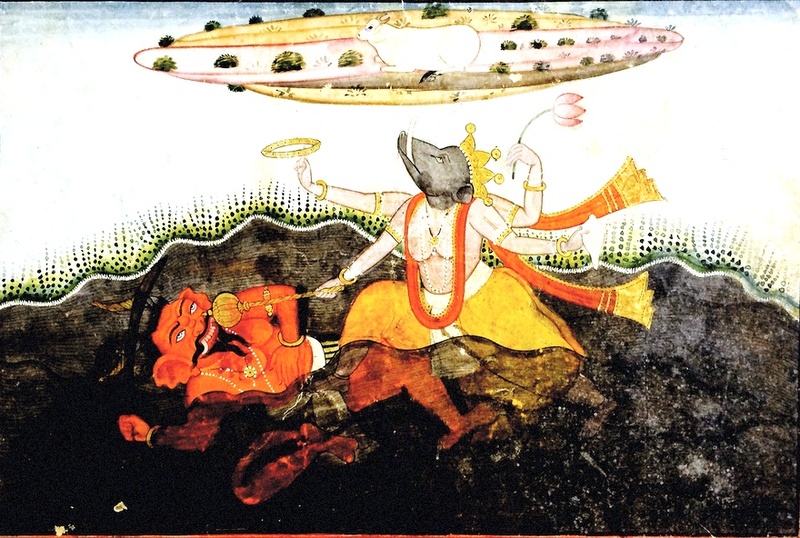 Since Hiranyaksha did not include the boar in the list of animals that can slay him, Vishnu assumes this form with huge tusks and goes down to the primordial ocean. 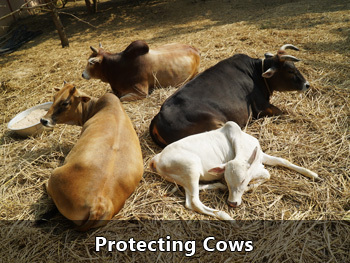 Hiranyaksha obstructs Varaha and the pair having a strong duel. Lord Varaha lifts the earth on his tusks, which would go on to be the most common figurine representation of Varaha. The two fought each other with their mace, with Varaha emerging victorious after a thousand-year duel. Varaha emerges from the ocean with the earth in his tusks and repositions her in her original spot. During Thretha Yuga, Bali the son of king Meganathan was ruling the kingdom in a righteous way. Demons Mali, Malyavan and Sumali and others sought the help of Bali to fight against the devas. 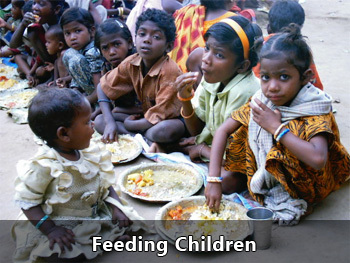 Bali simply declined to help them. The demons fought alone were defeated by the Devas. They came again to Bali for help which he obliged this time. Bali won the war but was afflicted with Brahmmahati dosha. 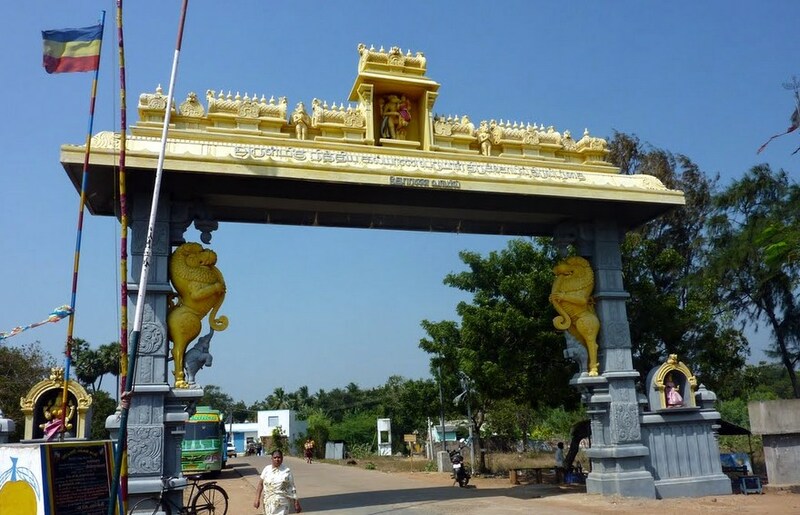 He came to this place for relief and performed penance on Lord Perumal. 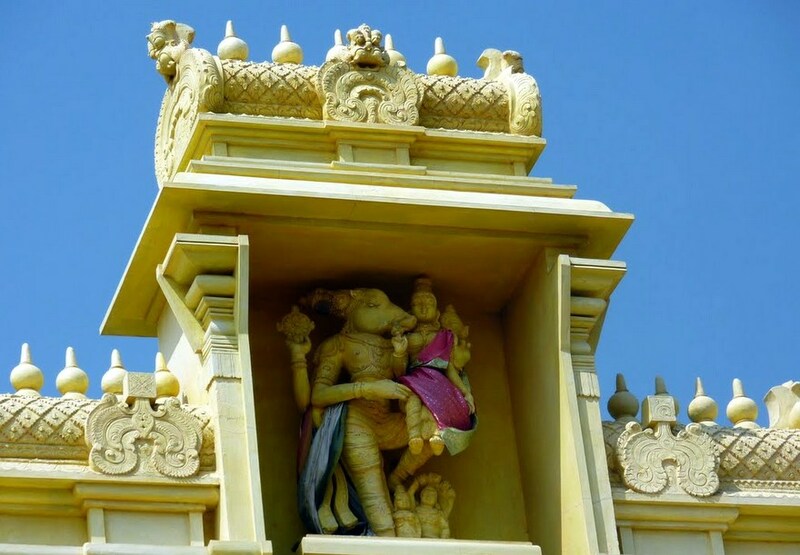 Pleased with his penance, Perumal appeared before Bali and granted darshan in Varaha Rupa. Sage Kuni and his daughter performed penance on Lord Narayana to reach Sorga-Paradise. Kuni alone reached Sorga but not the daughter. 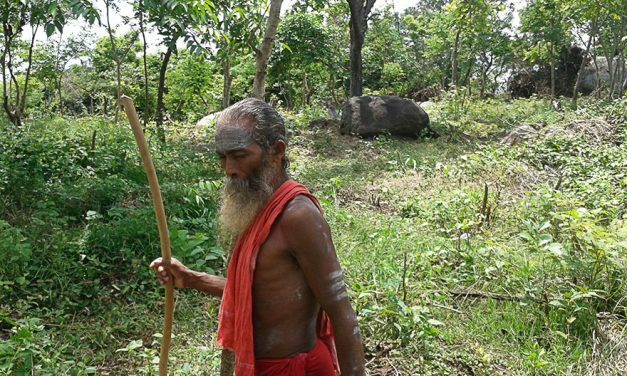 Maharshi Narada told the young girl that she could not reach Sorga as she was not married. He requested other sages to marry her. 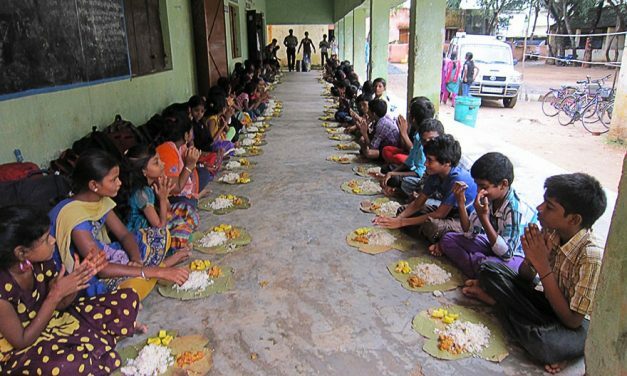 One Kalava Maharshi married her and got 360 female children. He performed penance on Lord Narayana begging Him to marry his daughters. 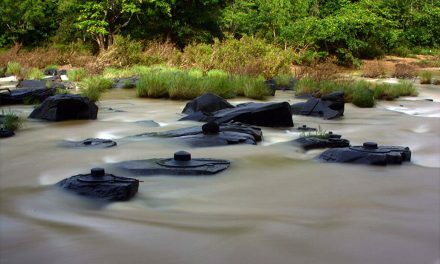 One day a handsome bachelor youth came to Thiruvidandhai as part of his holy pilgrimage. Kaalava Rishi requested the youth to marry his daughters. The young man agreed to marry one daughter everyday and the marriages went on everyday for 360 days. On the last day, the young man revealed himself as Lord Varaaha Perumaal to Kaalava Rishi and all the 360 daughters combined to become one woman, who was none other than Sri Lakshmi. The Lord gave her His left side and made her seated on His lap. 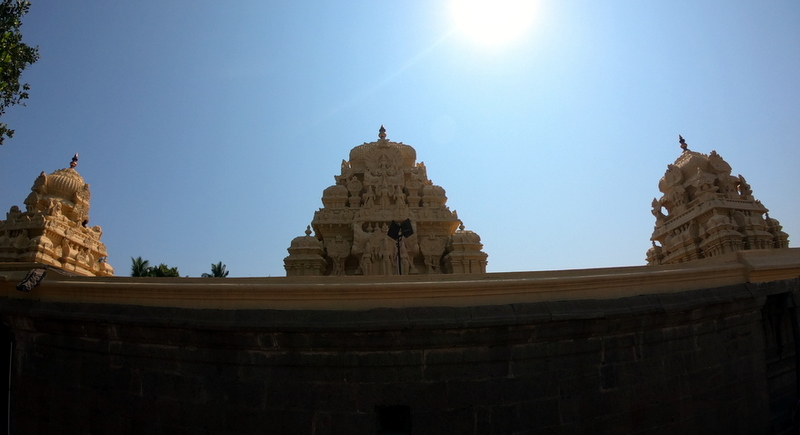 The Goddess here is called as Komalavalli Thaayaar, as that was the name of the first daughter of Kaalava Rishi. As all the 360 wives merged together as one, the Goddess here is also called as Akilavalli Thaayaar. This story also signifies the philosophy that the Supreme God is the only male of the universe, who is, the ‘Maha Purusha’ or ‘Purushothama’ and all the living beings are Naayagis or females who with much devotion can reach the Lord. 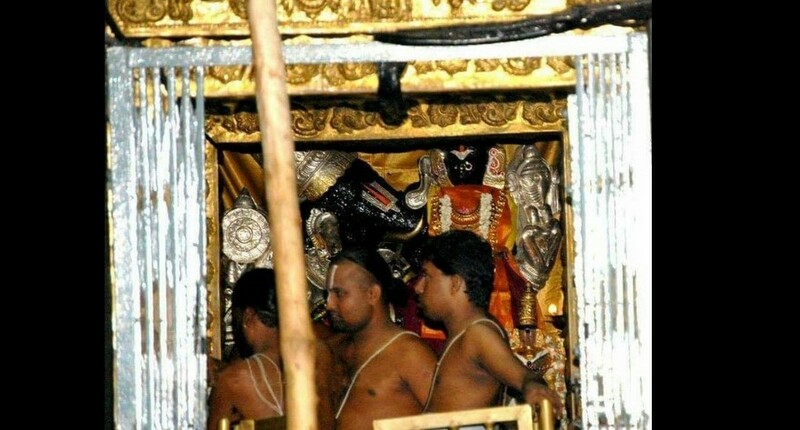 The Processional deities are Sri Nithya Kalyana Perumal, Komalavalli and Akilavalli Nachiyars. The naturally formed small mole like mark on the cheek of the Lord adds beauty to his already handsome face. It is said that the Lord’s mother-in-law made this mark at the time of the marriage to ward off the evil eyes. 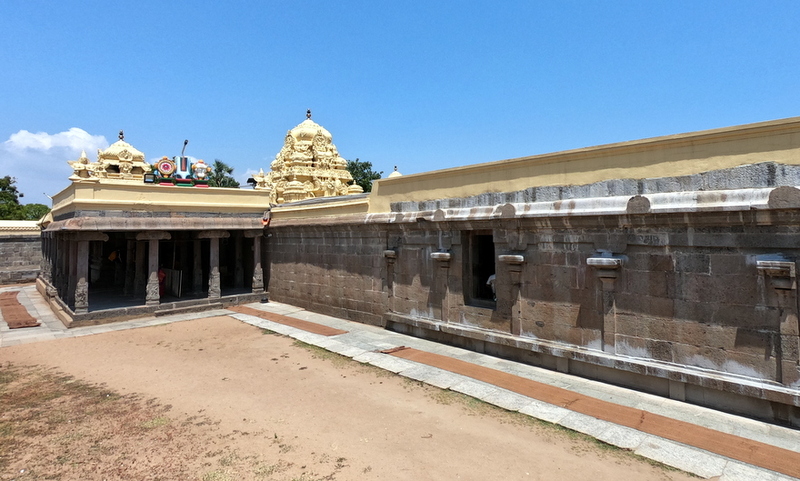 Following the legend of Nithyakalyana Perumal, where Vishnu is believed to marry daily, the temple is frequented by people seeking marriage or whose marriage is delayed. A common worship practice is to offer garlands to the presiding deity, wearing it and circumambulating the temple nine times after which they have to carry it home and keep safely till they are married. After marraige they bring the old garland and offer a new garland to lord and again perform pradakshina around the Temple. 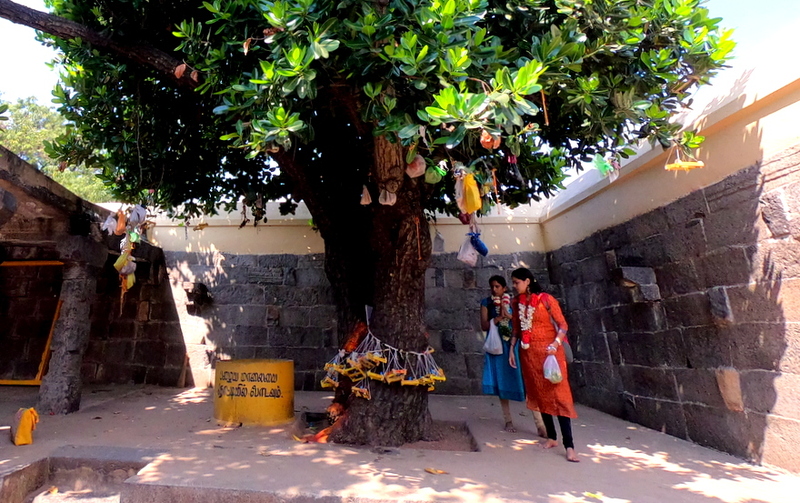 As a couple they offer the old garland to the Sthala Vriksham-Punnai tree at the backside of the Temple. Ranganatha, the reclining form of Vishnu, is believed to have attended the first wedding and after finding that there is a marriage every day, he set his abode in the temple. 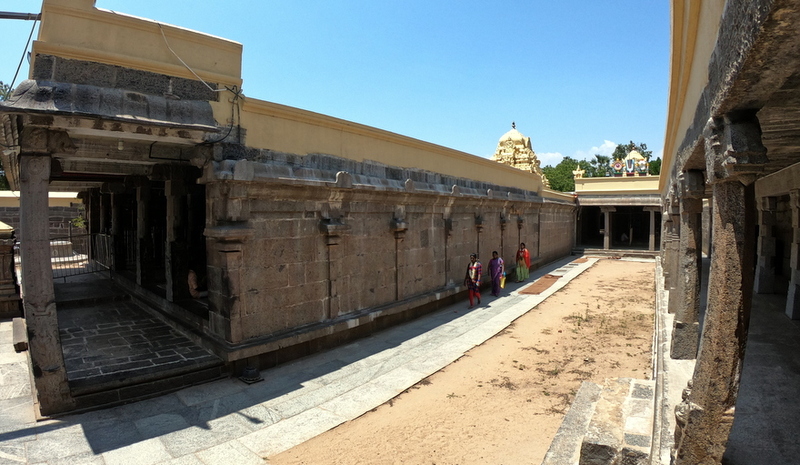 The temple was built during the Pallava regime in the 7th century, who had Kanchipuram as the capital and ruled the region during the 6th to 9th centuries. 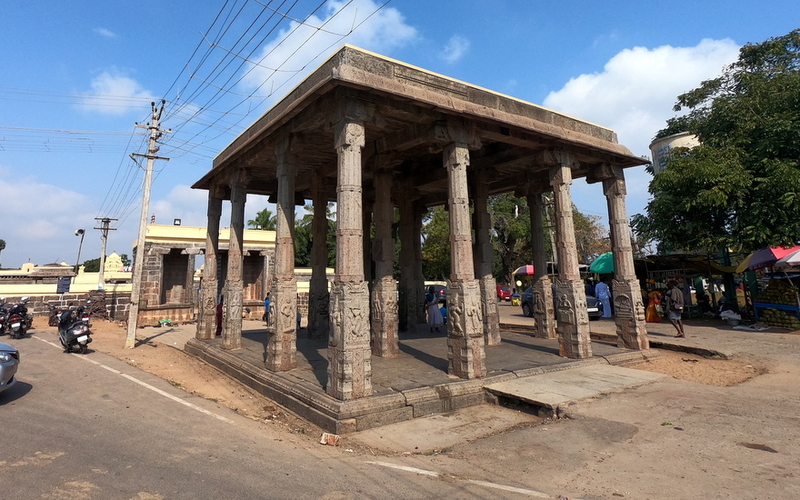 The temple has inscriptions dated 959 CE from the Pallava times. 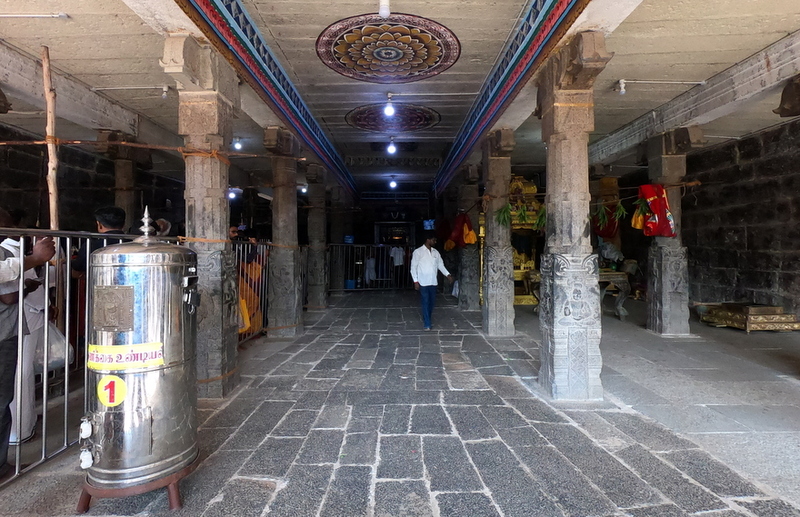 The sanctum is approached through a sixteen pillared sculpted hall in front of the temple. 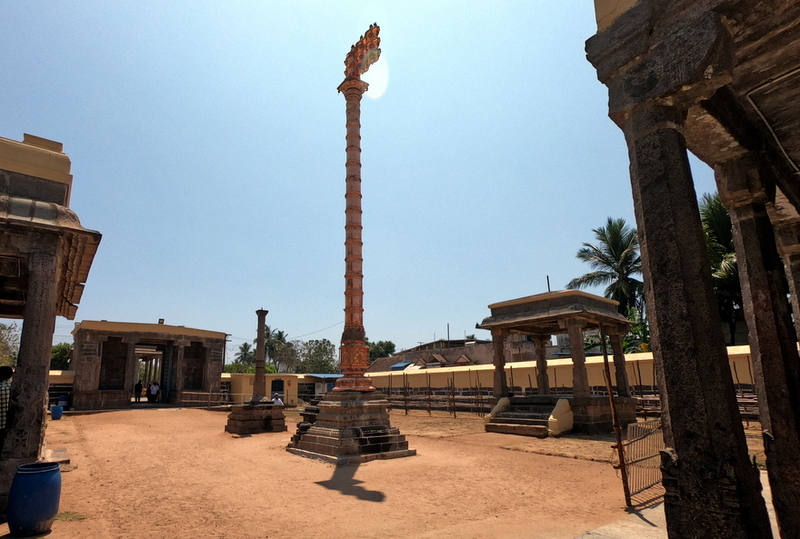 The pillars have sculptures indicating various legends, with one of them carrying the replica of the image of the presiding deity. 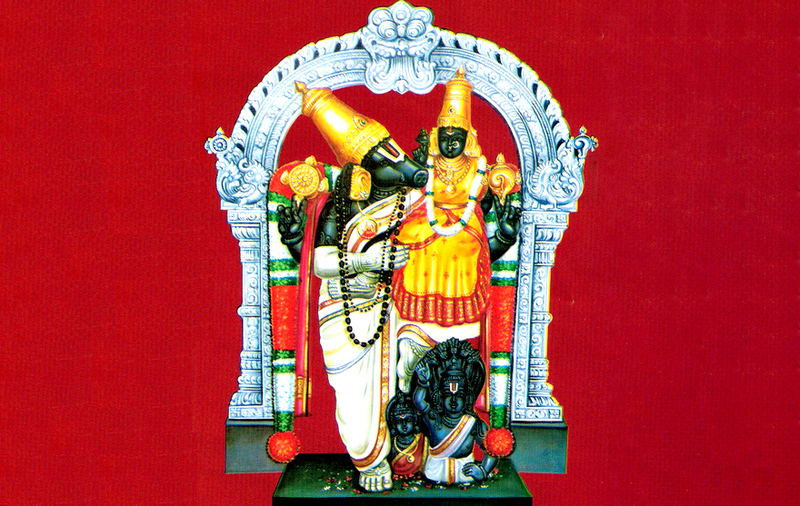 The granite image of Nithyakalyana Perumal in the form of Varaha having Bhudevi on his lap, is housed in the sanctum. 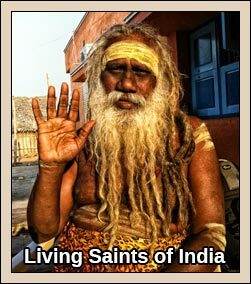 The image is around 7 ft (2.1 m) tall and is one of the rarest images of the deity. Garuda, the eagle vahana of Vishnu has a small shrine facing the sanctum. 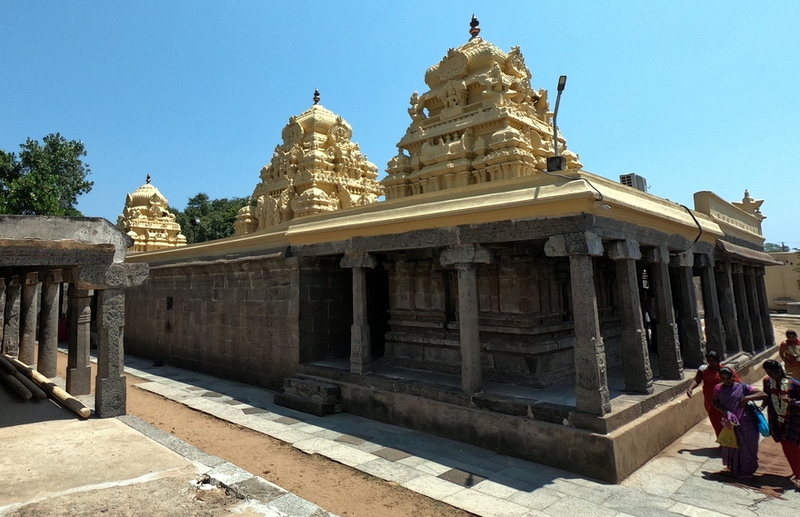 Right of the temple houses the shrine of Komalavalli. 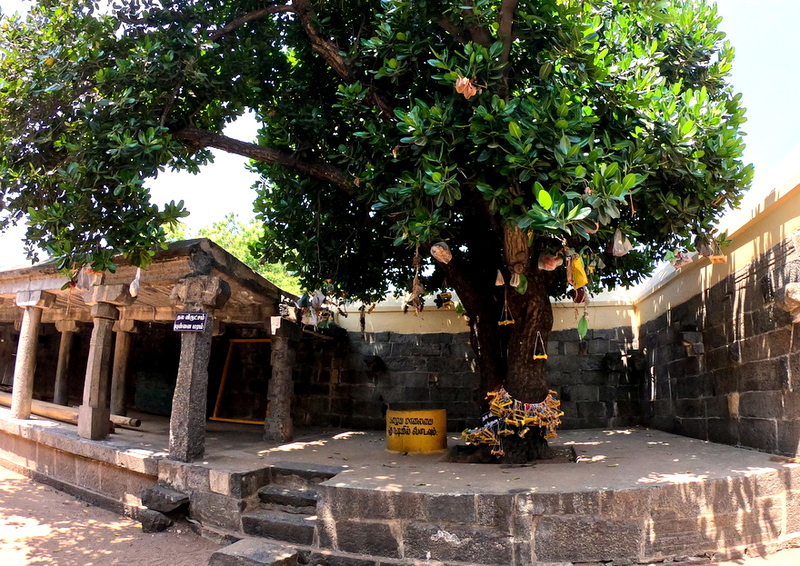 There is a separate shrine for Ranganatha and his consort Ranganayagi around the first precinct. 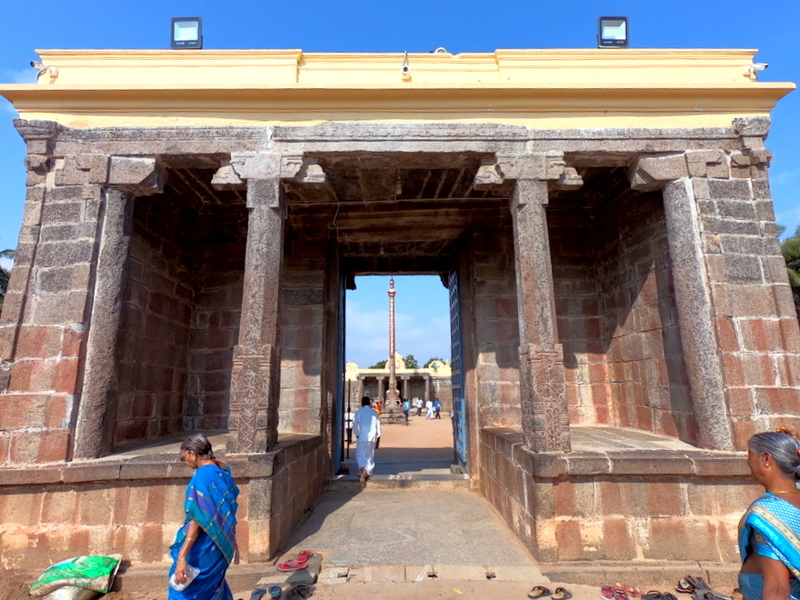 The shrine of Andall is located to the left of sanctum in the first precinct. There are inscriptions on the walls around the assembly and the prayer hall. 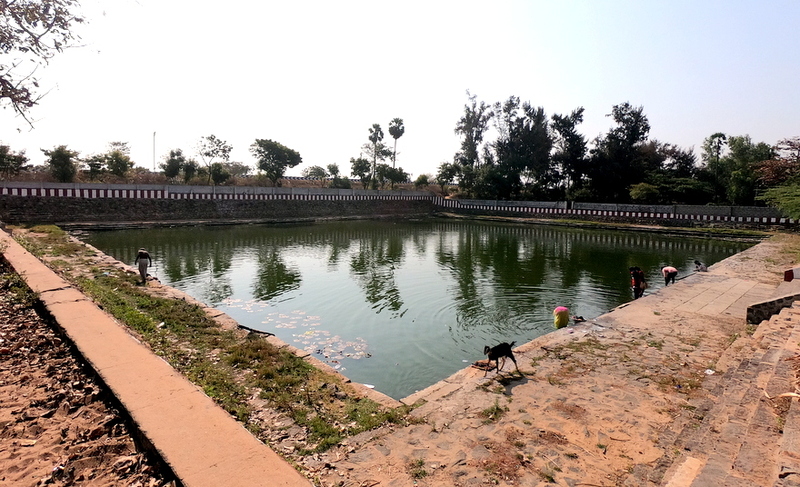 Kalyana Pushakarani is the principal temple tank located right opposite to the temple in the end of the street and visible from East Coast Road (ECR). 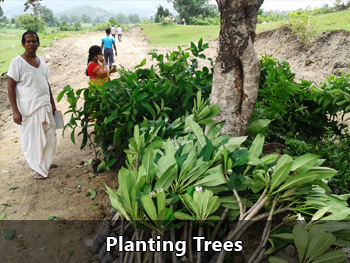 Punnai tree, which is usually associated with Shiva temples, is the sacred tree associated with the temple. 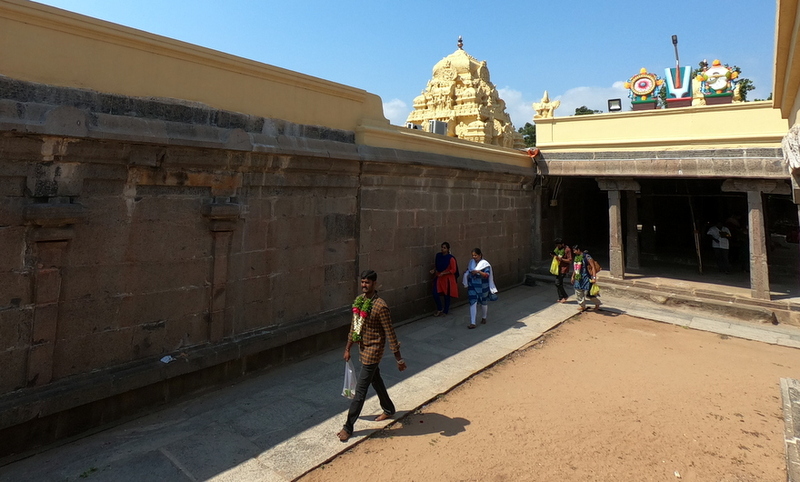 A granite wall surrounds the temple, enclosing all its shrines. 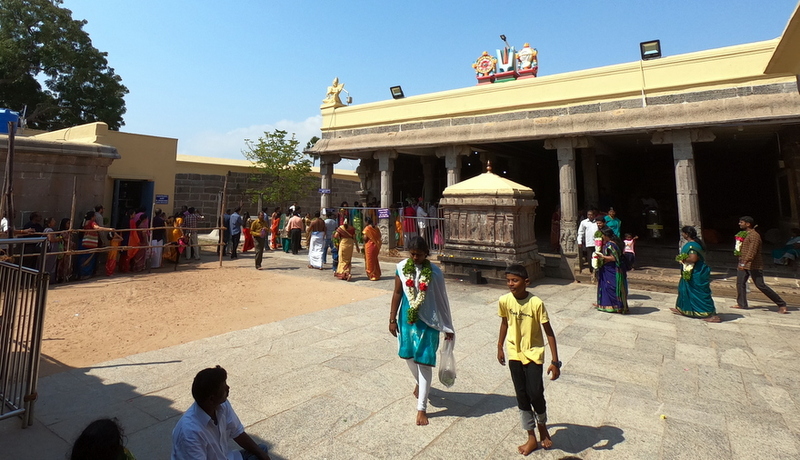 The temple follows Thenkalai tradition of worship. 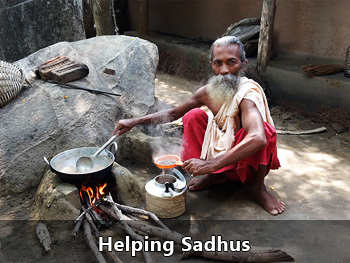 Four daily rituals and many yearly festivals are held at the temple. Though the temple is an archaeological site, the temple is active in worship practices. 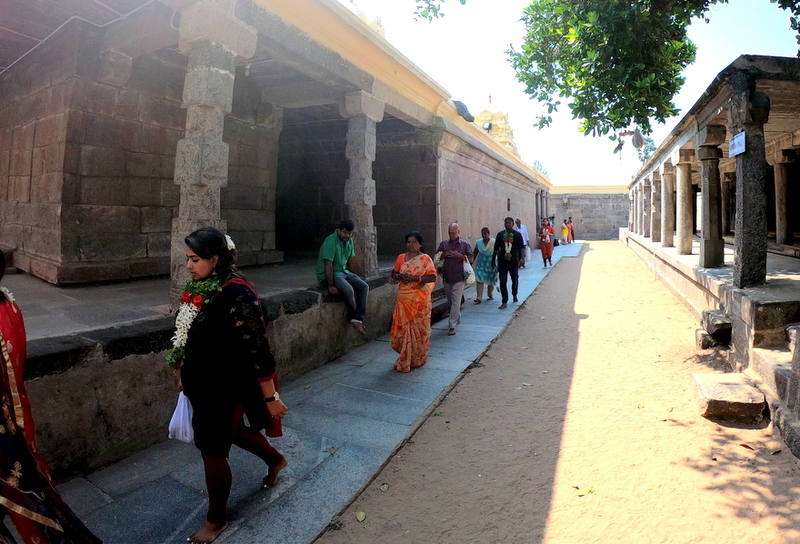 The temple follows Thenkalai tradition of worship based on Vaikasana Agamic tradition. The temple is open from 6:30 a.m. to 12 p.m. and 3:00 p.m. to 9:00 p.m. The Annual Brahmotsavam is conducted during Chittirai. 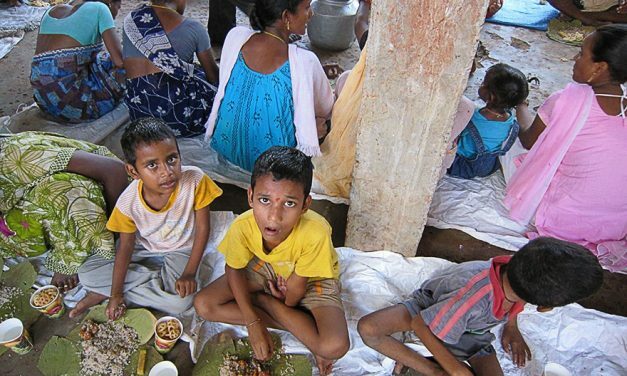 Garuda Seva is held during the months of Aani, Aadi, Masi and Thai. 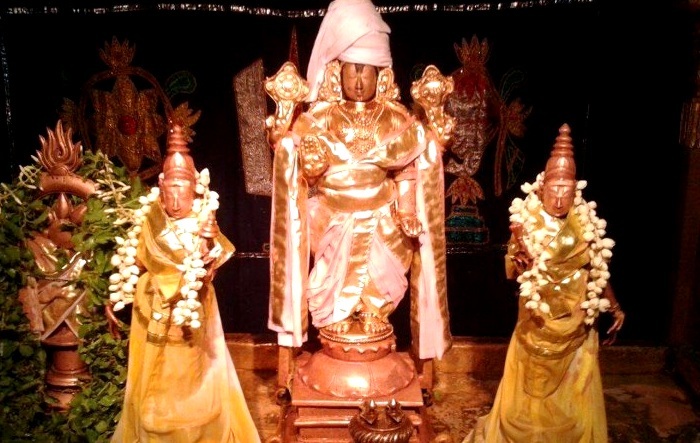 Vaikuntha Ekadashi is very devotionally celebrated in the temple in December-January. 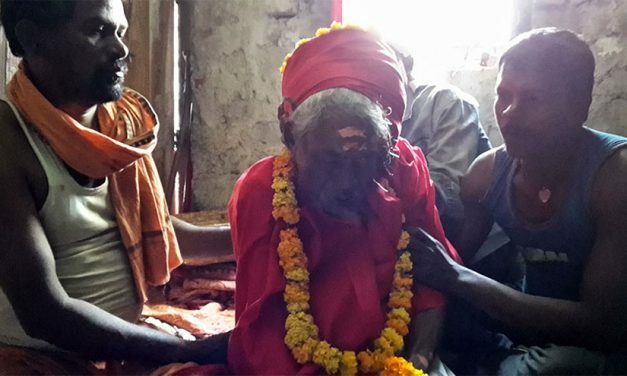 NextWho are the Grama Devatas?